Unplaced one run each at two and three in Australia, MISTER YEOH is quick to show prove his worth in Singapore. After his runaway win (by 7 1/4 lengths) in his debut last month, the son of Wanted was installed favourite in the Singapore 3YO Sprint on Mar 30 but failed to follow up despite given every chance out front. In the Singapore 3YO Classic today, MISTER YEOH was ridden of the pace by jockey Michael Rodd and he made amends to win by half a length from BE BEE who had won the 3YO Sprint. The pair will probably lock horns again in the Singapore Guineas (1600m) next month to determine who's is top of the crop this season. 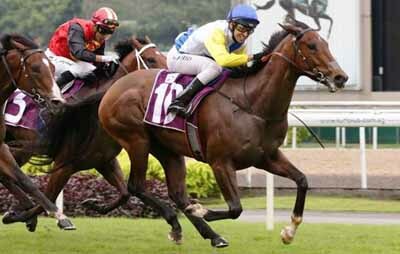 "MISTER YEOH’s a lovely horse and Michael Rodd gave him a 10-out-of-10 ride," said trainer Cliff Brown. "I was very happy with his run in the Sprint. He ran very well even if he didn’t win, and I knew he could turn it around in the second Leg, if things go our way, and they did." Brown and Rodd has combined to win the Classic-Guineas double with DEBT COLLECTOR in 2016 and they wil be hoping to do the same with MISTER YEOH.